The Generation Business conduct reviews of existing programs, and evaluations of completed projects or initiatives. Our review work uses robust methodology that ensures the broadest range of perspectives are represented, in ways that allow honest views to be voiced, while focusing on keeping costs low for the client. Post review—we work to improve the implementation of accepted recommendations. We are particularly interested in skilling and coaching internal teams to lead the identified changed. In our evaluation work, we believe in the importance of capturing and recording new learning so this valuable knowledge is transferred to future projects. At the same time we concentrate on appreciating the work done, and validating those who worked on the project for all they have achieved. 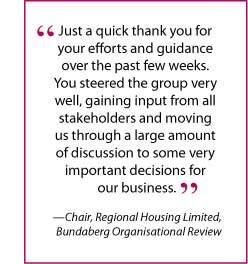 Some reviews The Generation Business has conducted include: an operational review of Health Community Councils in Queensland; an administrative services review for the Business Facility at the Queensland University of Technology; and an evaluation of Respite Childcare program for Anglicare.